When we got back to the hotel after our walk up Buramsan, I downloaded my photos to the hard drives I'd brought on holiday with me, and had a snack. 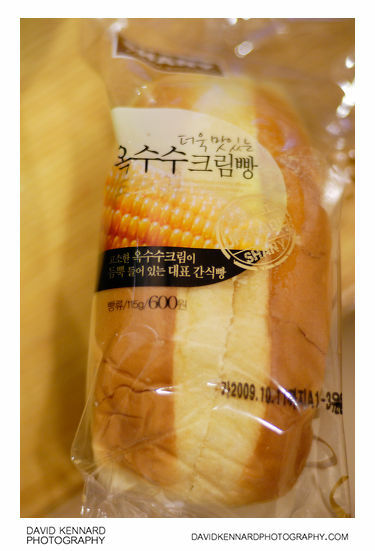 I had a Shany Corn Cream Bread, which I thought would just be like a bread roll. Actually though it was a sweet bread with a sweet cream filling. 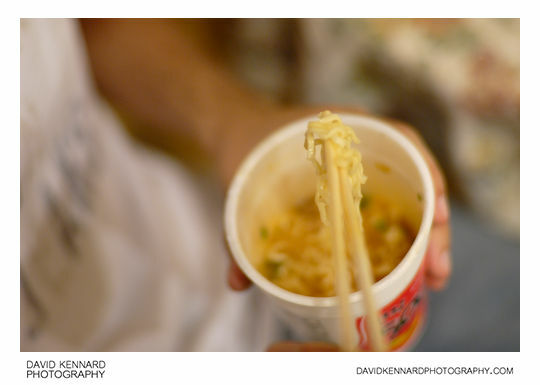 My brother, on the other hand, had a Korean pot noodle, known as Ramyeon (라면). In the evening we'd usually go out to have dinner at a restaurant in Myeong-dong, but I wouldn't take my camera gear with me as it would get in the way too much when in a busy restaurant. I wanted to take some panoramas of the areas we'd walk past on the way to Myeong-dong, so on the evening of our last full day in Korea I went out with my tripod in the evening to do some panoramas. This first one is Samilgyo (Samil bridge), which carries Samilro (Samil road) over Cheonggye stream, which runs through downtown Seoul. The bridge is lit up at the side by blue strip lights and in the middle of the road is a long sculpture that also has a blue light running along the centre of it. I think really this image could have done with a longer exposure as it's a bit too dark for my liking. You can see the 360° VR version here: Seoul at night – Samil Bridge 360 VR. Unfortunately bracketing shots to keep detail in highlights and shadows isn't really practical at night due partly to the amount of time it takes for each shot when using ISO100. The other problem is that the difference between highlights, such as bright signs and the shadows is much greater than you get in the daytime, so you'd need a very large bracketing range. The problem wouldn't be so great with a Canon camera, which can bracket in steps of 2EV, but my Nikon D200 I used for these shots can only bracket in 1EV steps. 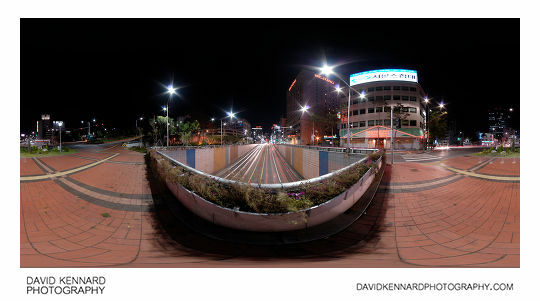 I also took another panorama around the same place that I had taken one the other day during the day time, outside the Young Nak Presbyterian Church 50th Anniversary Hall. 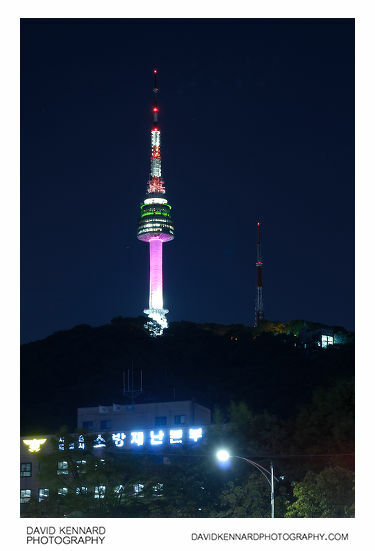 You can see the 360° VR: Seoul at night – Young Nak 50th anniversary Memorial Hall and Samil-ro 360 VR. With these night-time photos I would wait for cars to be coming up / down the roads before taking the photo so I could capture the light trails left by the headlights. 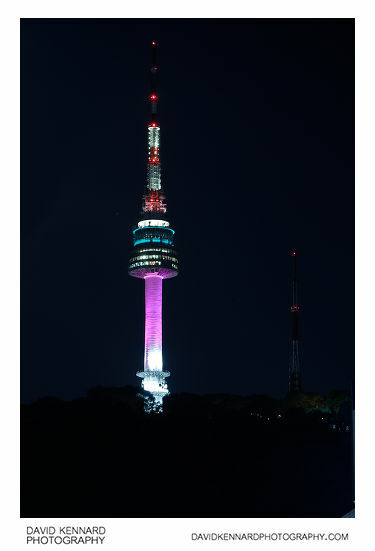 We didn't get to see the N Seoul Tower close-up at night, but I did take a couple of shots of it from Samil-ro. At night it is lit up, and sometimes they project light shows on to the side of the tower, and a laser show on to the plaza below it. On the night I took these photos it was just lit up with plain purple and white lights. 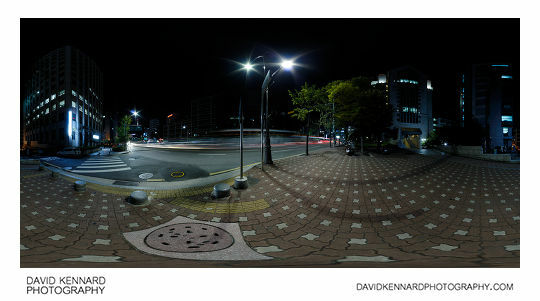 Carrying on the same route that we used when visiting Namsan, I took another panorama at the Togyero intersection. 360° VR version: Seoul at night – Toegyero intersection 360 VR. In this photo you might notice some ghostly feet with no body. I would guess that the dipped headlights from a car were low enough to illuminate the person's feet, but not their body, and this is why only the ghostly images of their feet were recorded. Similar to the other panoramas I'd taken at night previously, touching up the nadirs of these images in Photoshop to remove the tripod was quite a lot of work. Due to the low light levels taking a handheld nadir shot without the tripod in it wasn't possible. This last one from the evening walk was taken outside a large development (101 Pine Avenue - 101파인애비뉴건) where they have light up animal silhouettes on the temporary wall. 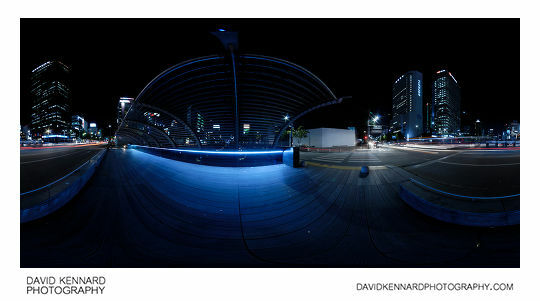 (360° VR version here: Seoul at night – Bus & 101 Pine Avenue development 360 VR). I guess it's such a high class development that even the boards around the outside of the construction area are posh. I took the panorama near a bus stop (though I tried to keep far enough away that the bus drivers wouldn't think I was waiting for a bus). Buses seemed to come along fairly regularly, so I took a few shots where a bus was coming up to and also leaving the bus stop. 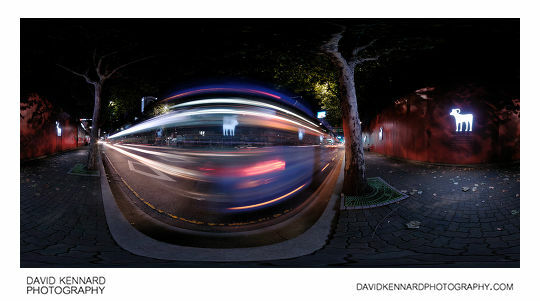 I think this adds more interest to the image than just having a clear road with the shops on the other side visible. 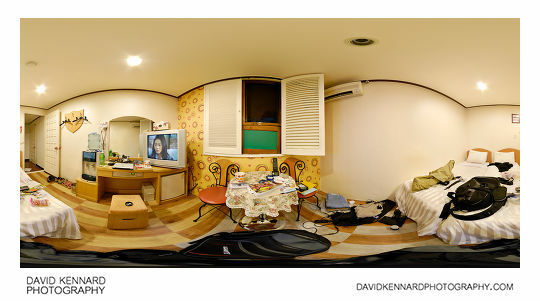 Back at the hotel, I took a panorama of our hotel room (360° VR). You can see the room is quite messy with various bits of my camera gear scattered across the floor and beds. For the nadir of this image, because there were bags and bits of wire etc. below the tripod, there was no way I would be able to re-create them in Photoshop. And there wasn't enough light to do a handheld nadir image either. So I took two offset nadir images, similar to what is described here: Offset nadir technique. This allowed capturing what was under the tripod, but the angle that the items were at differed depending on what side of them the tripod was offset to. So it was still very difficult to patch the nadir for this image. I also cloned the tripod out of the mirror for this image, and blended in the TV image from a shot that was taken at a much darker exposure. Otherwise the TV would just have been blown out white.